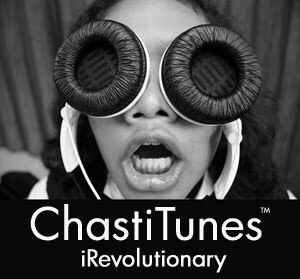 A recent ChastiTunes ad that ran in Rolling Stone. Turning the business model on its head, a new streaming service purposely serves up the most hated songs and videos. So who would use such a service and for what purposes? As it turns out, ChastiTunes users are much more than musical masochists and morbid curiosity seekers. Take over-the-road trucker Sam Peyden for example: Sometimes he runs out of speed pills on the road but still needs to stay awake. That's a perfect time to use the new streaming service and app according to Peyden. "I put ChastyTunes on the Rap setting and that infuriates me enough to stay awake for days at a time. If I'm feeling nostalgic, I have a Barry Manilow channel that really pisses me off: See, I used to have a girlfriend, back in the day, she made me listen to Barry Manilow, we've been married thirty-five years now." Party DJ Samantha Jurba uses ChastiTunes Pro to augment her already immense collection of music. Jurba talked about why she is sold on the new service. "It's great for a small business like mine, I can stream anything on their servers or I can buy and download songs and videos if that's my choice." "They've already put together some of the most unpopular songs and videos, which are surprisingly popular at wedding receptions and parties. You know some songs are so bad people love to hate them and maybe even hate to love them as well. Gangnam Style and Friday are like that, oh yeah and and My Humps--people love to hate on that one too." ChastiTunes is also signing licensing deals to stream the most hated movies later this year. Movies in the potential line-up are Dirty Dancing, Gigli, Batman (Ben Affleck version), Battleship Earth, and most Adam Sandler films.